about your experience so far with Google Data Studio. The survey should take around 10 minutes to complete. Your comments will help us build a better product! Note: Your answers will be held in strict confidentiality. The results will be reported in aggregate form only, and cannot be identified individually. Thank you! Are you a current or past user of Google Data Studio? We would love to hear your thoughts about your experience so far with Google Data Studio. ). It's a giant leap forward from the old Google Analytics dashboards and a game changer for online marketers. 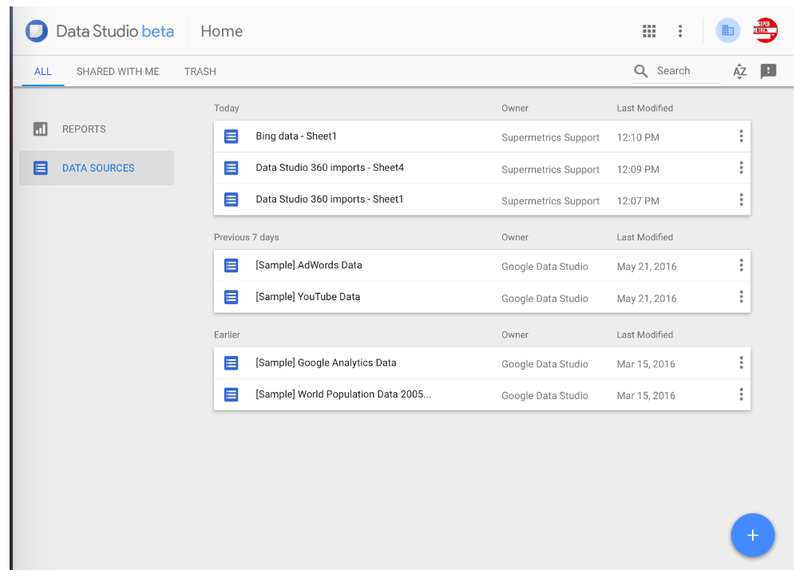 Google Data Studio provides native integration with a few Google platforms (Google Analytics, AdWords, YouTube, BigQuery, Attribution 360). Of course, most marketers, to use Google Data Studio as their primary dashboarding tool, would like to include data from many more sources, such as Facebook Ads, Bing Ads and Twitter Ads. Fortunately, there’s a really simple method for adding many more data sources into Google Data Studio, using its Google Sheets connector. Here’s a quick step-by-step guide for doing that. There are a number of ways to do this. For instance, to get Facebook Ads data, you can go to Facebook Ads Manager to do a CSV export of your data, and then upload it to Google Drive. For some data sources, you can use spreadsheet functions like IMPORTXML. Or you can build your own Google Apps Script connectors. 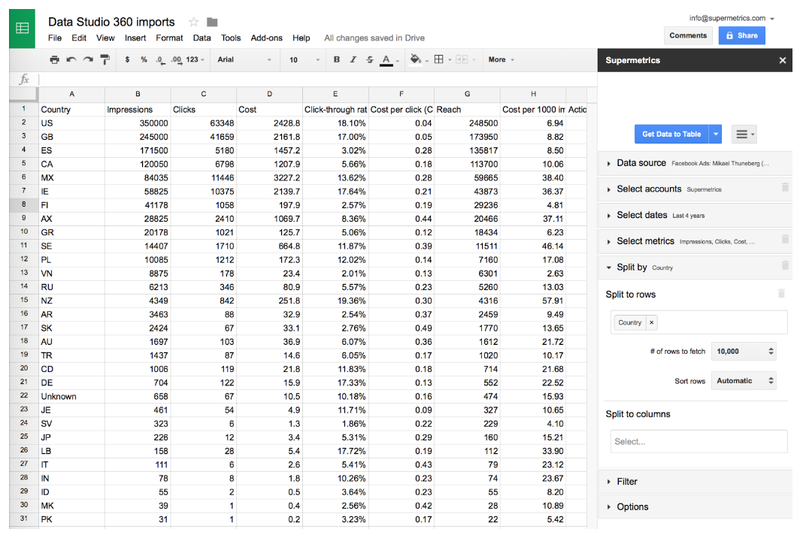 For a fully automated data importing workflow, I recommend you try our Supermetrics add-on for Google Sheets (available here; free for 30 days, then $49/mo). It has an easy-to-use query builder and connects to a large number of data sources, like Facebook, Bing, Twitter, MailChimp, even Adobe SiteCatalyst. If you don’t want to test Supermetrics now, you can make a copy of this sheet to try out the following steps. You can launch Google Data Studio here. If you haven’t yet used Data Studio, you can get the free version here (US only for the time being). Next, Google shows you a list of fields imported from the Google Sheet. Click CREATE REPORT, and in the next window, ADD TO REPORT. You now have a blank report where you can start working with the data. To check everything has been imported ok, try inserting a table. You can change the columns displayed in the Table Properties sidebar. In many cases, you will want to include more than one Google Sheets data connector, to fetch data from different sources or with different metrics & dimensions. This can be done very easily, just repeat step 1 and 2. Go back to Google Sheets to fetch new data, e.g. Twitter Ads, to another sheet. Then in Data Studio, when adding a graph or table, in the properties sidebar press the arrow next to Data Source to add a connection to the new sheet. If you used the Supermetrics add-on to fetch data into Google Sheets, you can set the those queries to refresh automatically every day, so your Data Studio report will always have the latest data. 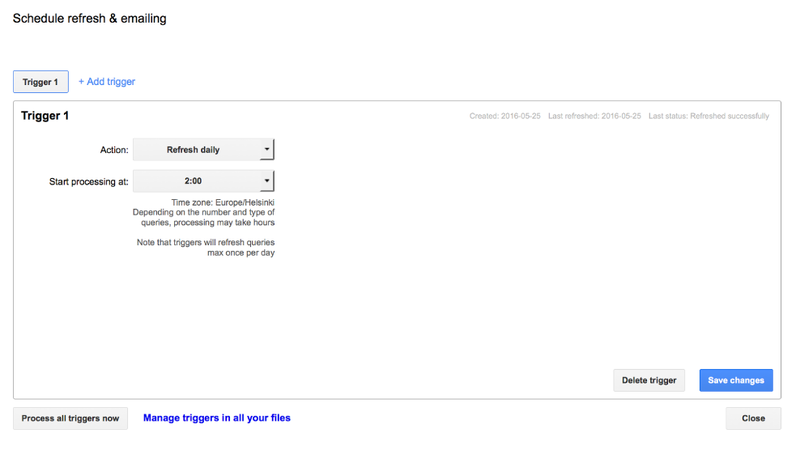 In Google Sheets, go to Add-ons: Supermetrics: Schedule refresh & emailing, and store a daily refresh trigger. Google Data Studio is a powerful dashboarding tool for any marketer, but by default only works with Google platforms. 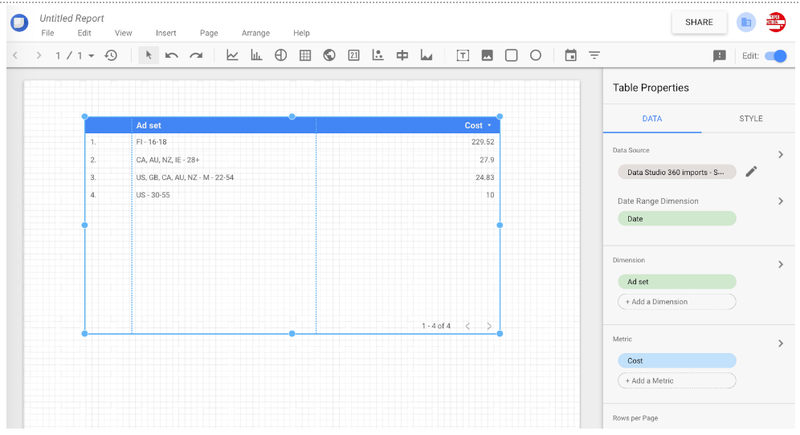 To make the most of it, use its Google Sheets connector in combination with the Supermetrics Google Sheets add-on to build cross-channel reports. Google Data Studio is the biggest step forward in Google’s data reporting & visualization offering since the launch of Google Analytics in 2005. 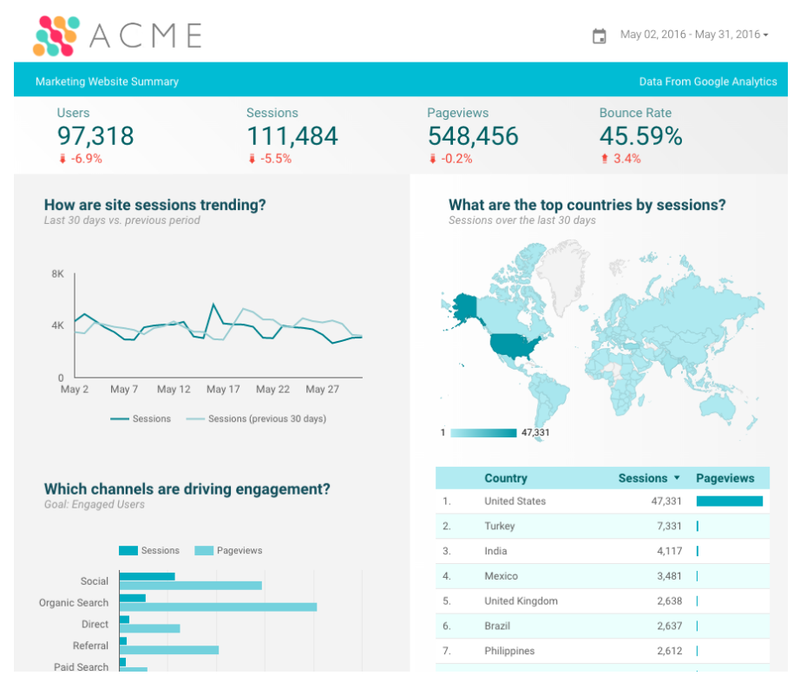 It lets you build great-looking, interactive dashboards that you can share in a similar manner as Google Drive files (see for example this web analytics dashboard). It's a giant leap forward from the old Google Analytics dashboards and a game changer for online marketers.